It took years for this H. macrophylla ‘Enziandom’ to live up to its name as the bluest of the blues. This picture doesn’t do justice to its deep intense color. 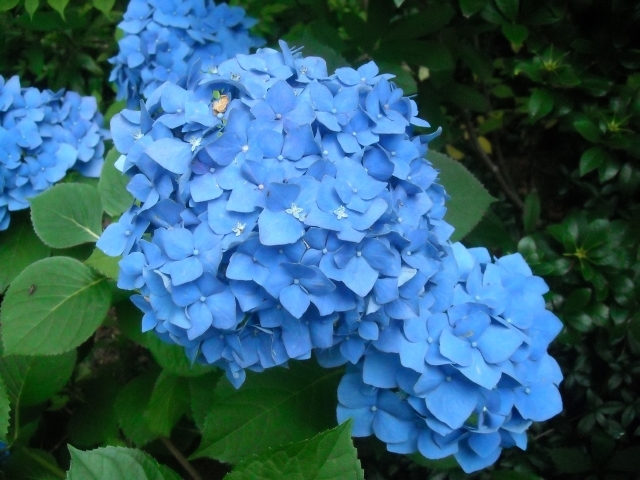 So, you really want those electric blue blooms on your Hydrangea macrophylla, aka big leaf hydrangeas, hortensia, French hydrangeas. 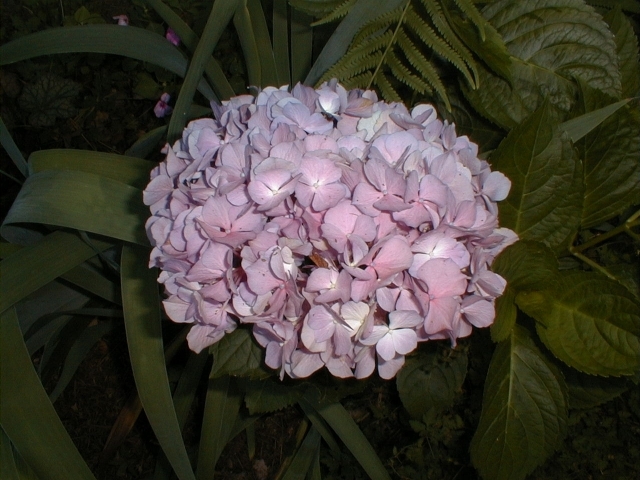 Over the years we’ve had a lot of fun fiddling with the fickle colors on our hydrangeas. We can tell you why and how blooms are blue. We just can’t guarantee a word we say. The next few paragraphs may get a little technical. Relax, we’re not chemistry junkies. We simply thought you might like a background check before fooling around with chemicals. The linchpin for creating blue blooms is aluminum. It must be in the soil if you want the blues. Sorry, shredding soda cans and tossing them into the mix won’t work. The aluminum has to be water soluble so roots can absorb it. Here’s the thing about aluminum. It’s the most abundant metal in the earth’s crust. In fact, total aluminum in the top six inches of soil averages out to be about 140,000 pounds per acre. Whew! However, we gardeners are only concerned with one form of aluminum, often called available aluminum (Al+++) because it is water soluble. Paradoxically, aluminum in any of its forms is not needed by plants, and most forms of aluminum have no effect on plants. Except for one, Al+++. Not only can it get us blue blooms, too much of it can be toxic. It stunts root growth, and we all know what that can lead to. (No, you can’t blame the latest garden plant to die on aluminum toxicity. You probably didn’t water it enough, or you watered it too much, or the dog did a number on it or the deer ate it, or. . .
Now, here’s the rest of the story. Al+++ doesn’t become available to plants unless the soil is acid. 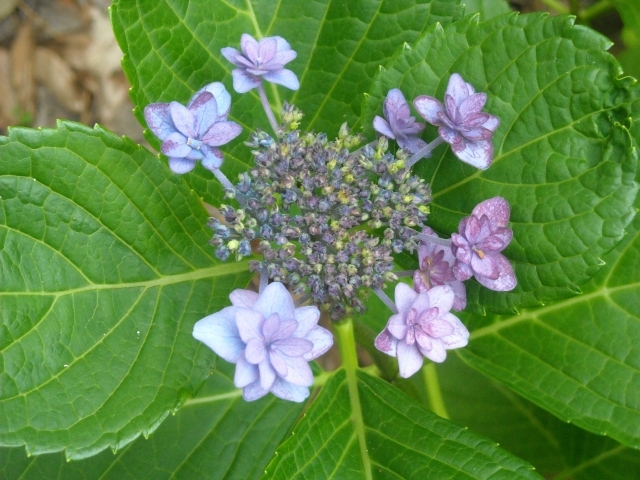 This is why acid soil has become a buzz word for blue in the hydrangea world. 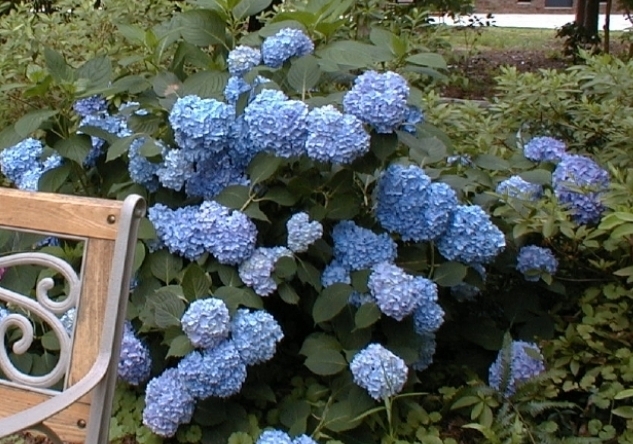 In reality, you need three conditions for blue blooms: available aluminum, acid soil, and water. How can you find out whether your soil is acid? Get a reliable soil test through your state’s Cooperative Extension. How can you create conditions for blue blooms? Here’s an answer: Aluminum sulphate. 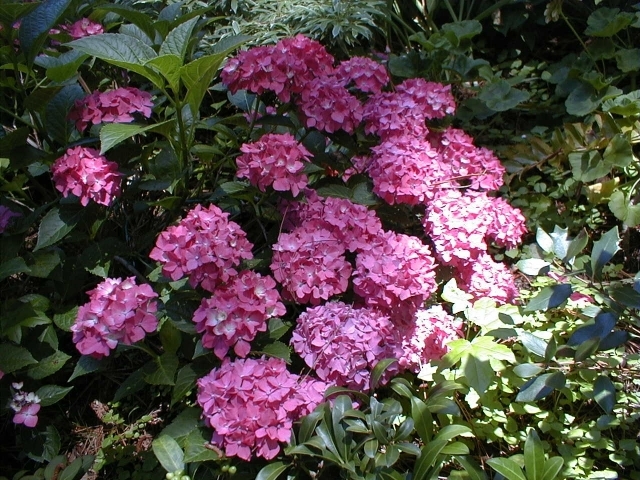 Mix with water and apply it to the soil around the plant once or twice at intervals, according to directions on the bag. 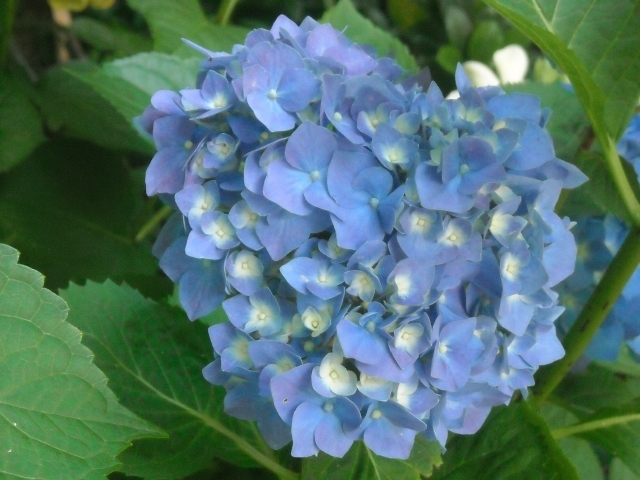 Aluminum sulphate is handy because it supplies both the aluminum and acidity that you need for blue blooms. Simple enough. See Our Experiences below for a discussion of our results. Important: Don’t use aluminum sulphate on other plants. In neutral soil the aluminum won’t have any effect on plants, but in very acid soil, it could become toxic, in which case you would then have to apply lime or phosphorus to counter acidity which could then counter aluminum toxicity. Things get complicated when you start fooling around. 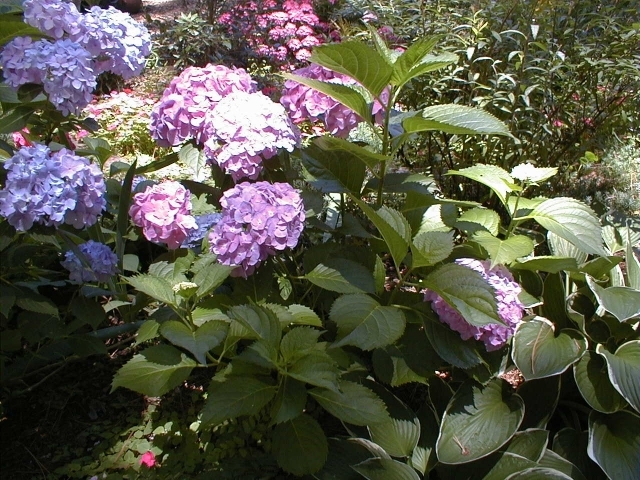 If you simply want to lower your soil pH, sulfur is effective and may very well make enough aluminum available to the plant to give you blue blooms. Follow directions, apply in several small applications, and wear protective gear. Ammonium sulphate or ammonium nitrate will also acidify soil. These products are pretty much only available from agricultural supply outlets and only used by farmers and bomb-makers. So don’t act suspicious when purchasing a small quantity (which is an automatic tip-off that you are not a farmer). Kindest to the environment are compost and organic fertilizers like Holly-tone, which is a blend of ingredients for acid-loving plants. If applied regularly, they may, over time, give you the blues you seek. Here are some reasons why blue blooms can be elusive. 1. Blue pigment must be genetically present in the blooms, ready to be awakened by available aluminum. Plants that are genetically red or white will never become pure blue, though reds can eventually take on a purple hue and whites can develop pink or blue tints depending on acidity. 2. 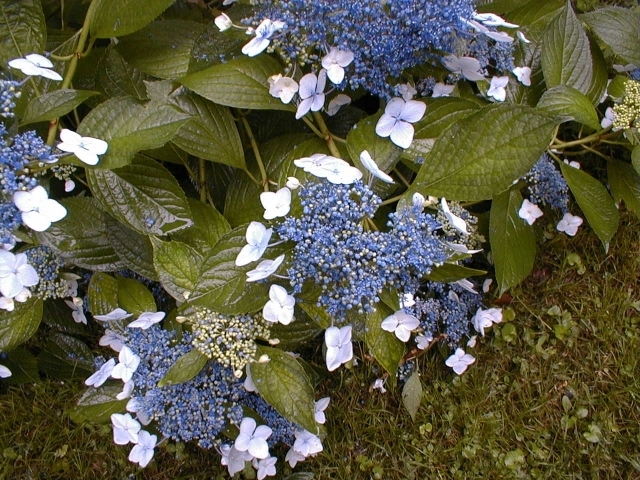 It can take a couple of growing seasons for young hydrangeas to absorb enough aluminum through their roots to produce blue blooms. Young plants grow less quickly in acidic soil, so they are raised by nurseries in neutral growing media for speedy production to market. They need time to adjust to your soil. Exception: Blooming blues that you see in nurseries have been regularly treated with aluminum sulphate but only after buds develop. 3. 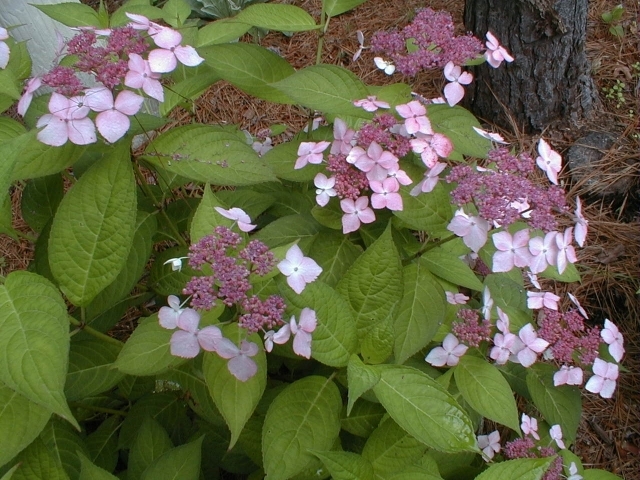 Marble chips, concrete pavement and stepping stones near a hydrangea can leach lime into soil, decreasing acidity to the point where aluminum is not available and sending blooms into pink territory. That’s one way to try for pink blooms. Adding lime in spring and fall or burying chunks of concrete for slow release of lime are other possibilities. 4. Standard 10-10-10 fertilizer (Nitrogen, Phosphorus and Potassium) will not necessarily bring out the blues. 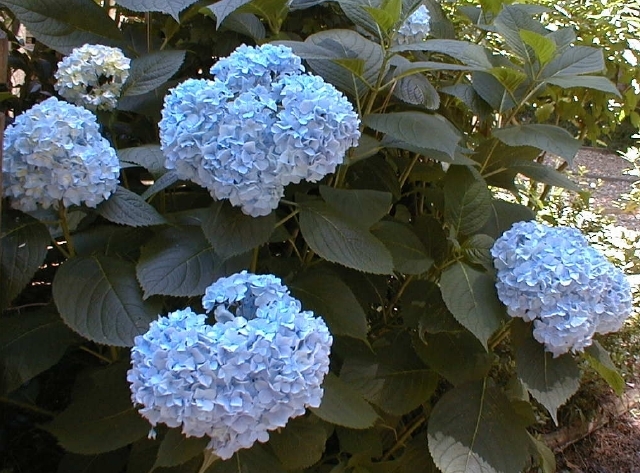 Fertilizers with low phosphorus and high potassium promote blue blooms. 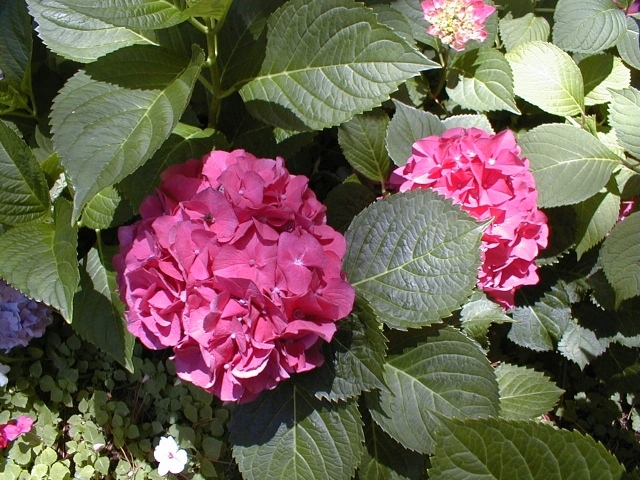 Fertilizers with high phosphorus promote pink blooms. Choose accordingly. Either use slow release, or apply a couple of half-strength applications spread out between early spring and early summer. Organic fertilizers such as Holly Tone and blood meal promote acidity. Purchasing blooming plants is the best way to see what color you are supposed to get. This tactic is not foolproof, but it gives you a fighting chance. Labels get mixed up in nurseries, so a young, non-blooming plant may surprise you when it eventually blooms. And finally, there is the X factor. 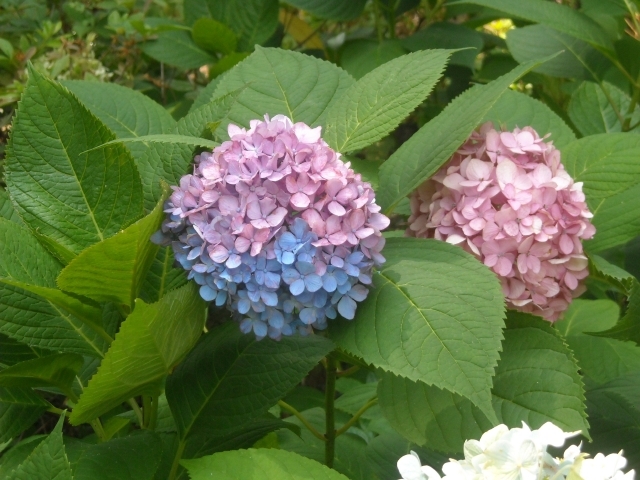 We’ve had blues turn pastel pink in soil that tested acid and pinks bloom blue in soil that tested neutral. Enough said. 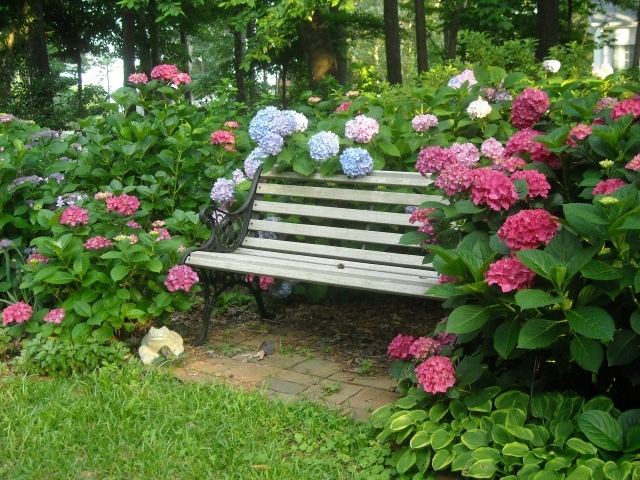 While the garden was young, and the hydrangeas were new, and we were energetic and omnipotent, we did all the stuff we talked about above. We became mad scientists. Loblolly pine was the dominant tree on our property. Aha, the soil must be acid. Why weren’t we getting blue blooms? We set out to prove acidity scientifically, by testing our soil, not once, not twice, but three times. By the state of North Carolina. With a pH meter. And a pH test kit. All three tests came back neutral. So much for foregone conclusions. Well, we mad scientists would turn this situation around. 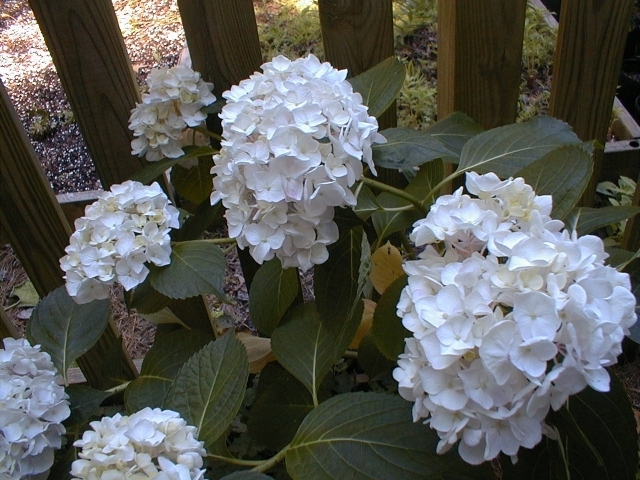 We doused the soil around our hydrangeas with aluminum sulphate. They said we’d see results pretty fast. How could we lose? D’ya think that flower might be a tad bluer? Not sure. . . . Let’s try again. D’ya think that flower might be a tad bluer? Can’t rightly tell. But look, the pink over there that we didn’t treat is beginning to turn blue. Hey, this works in nurseries, why not here? After a few years, a funny thing happened. We were mulching with shredded garden waste, which composts quickly in our hot summers and tends to increase acidity. We also used Holly Tone and blood meal, which are acid fertilizers. And the blues became mostly blue. But the pinks! Once, without thinking, we scattered Holly Tone around pretty, pinky-mauve ‘Preziosa.’ What a disaster! She turned drab lavender-gray before our eyes and didn’t recover for several years until we finally transplanted her. After that we never used acid fertilizers on reds. And we quit being mad scientists. 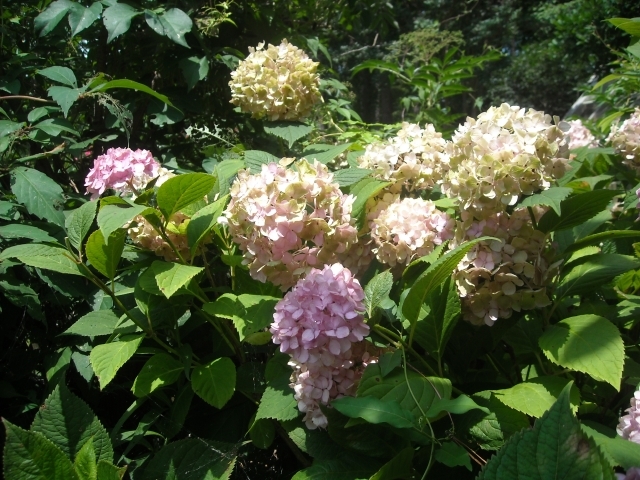 Now that we are no longer quite so energetic or omnipotent, we let our hydrangeas surprise us. 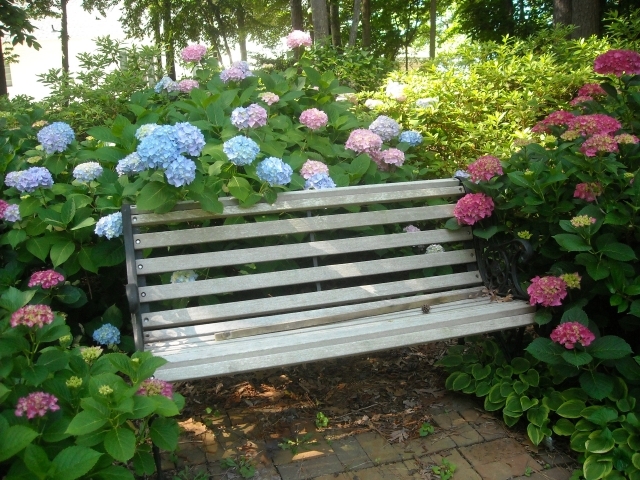 We give them a light sprinkling of 10-10-10 in spring, if we remember, and we mulch them with fallen leaves each fall. Our faithful reds may some years exhibit subtle purple washes, and our blues may be a pale combination of pink or rose, or blue. We suspect that our clay soil and rainfall amounts and temperatures at critical times play some part in juggling the colors, but we haven’t quite figured out how. We like doing less work, and we like being surprised. Really liked what you had to say in your post, (2.8) Stalking the Big Blue Blossom | A Heron's Garden, thanks for the good read! Merely wanna remark on few general things, The website style and design is perfect, the content is rattling superb : D.
wow, it’s astonishing how relevant this article is. thanks for posting such rich content. this is refreshing to see.